Big A loves dinosaurs. As do many little boys. 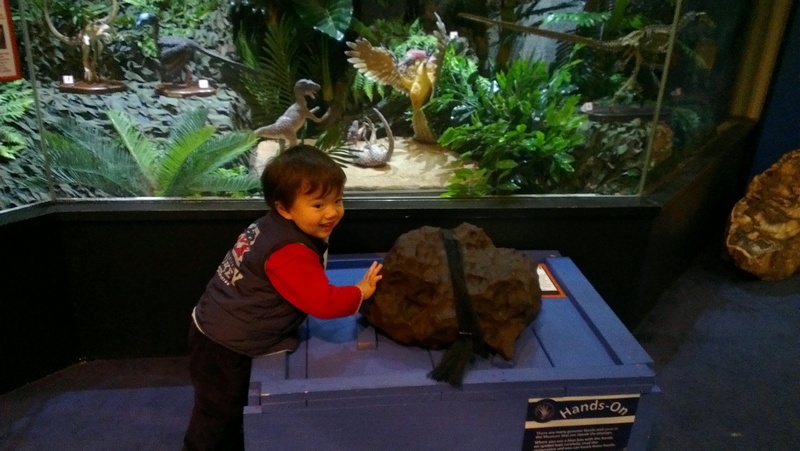 So he was super excited about a planned visit to the National Dinosaur Museum in Canberra. And by the end, both he and Little A were yelling loud dinosaur ‘yaaaahr’ cries, which continued for hours afterwards. 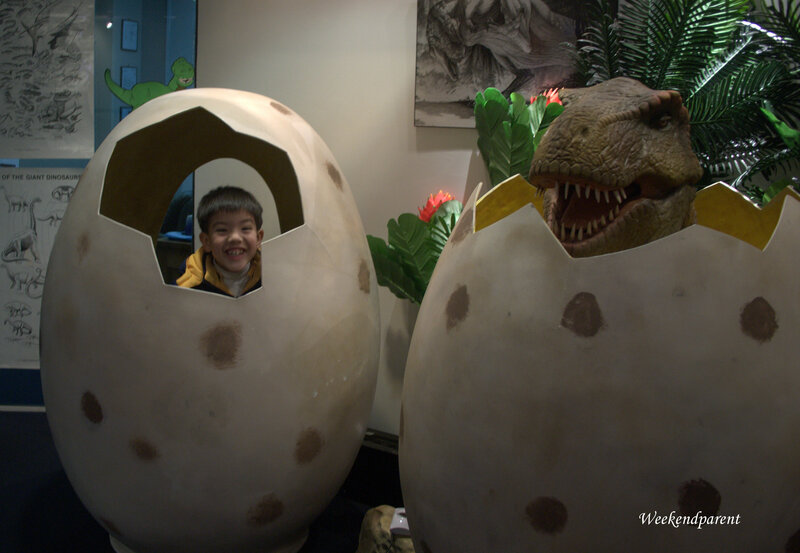 Last year, we visited a dinosaur exhibition in Taichung (central Taiwan), and later a travelling exhibition in Taipei that featured several large (and scary) moving dinosaurs. Big A was so scared that he cried! But later, he insisted that we read a dinosaur book to him every night. And he learnt nearly all of the dinosaur names: at four years of age, he had many of them memorised by heart. “Which staurus is this one, mummy?” he would ask for the ones he didn’t know. 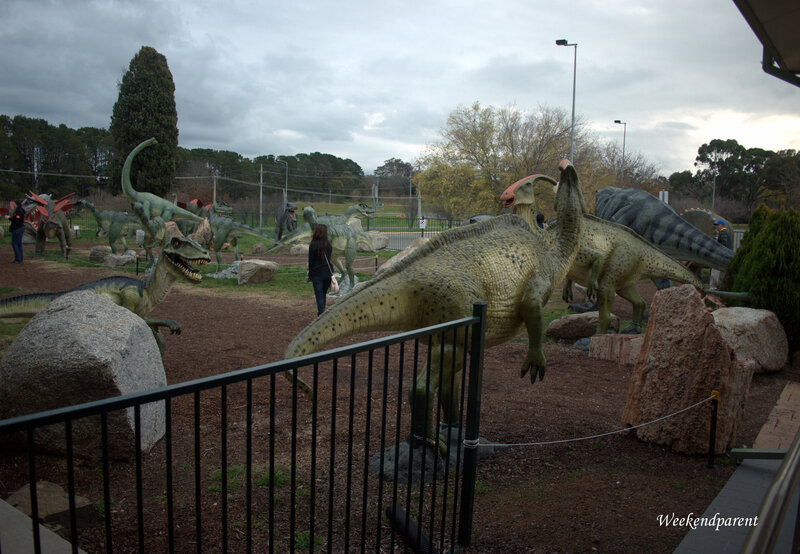 Consequently, we expected big things of the National Dinosaur Museum in Canberra, and it did not disappoint. 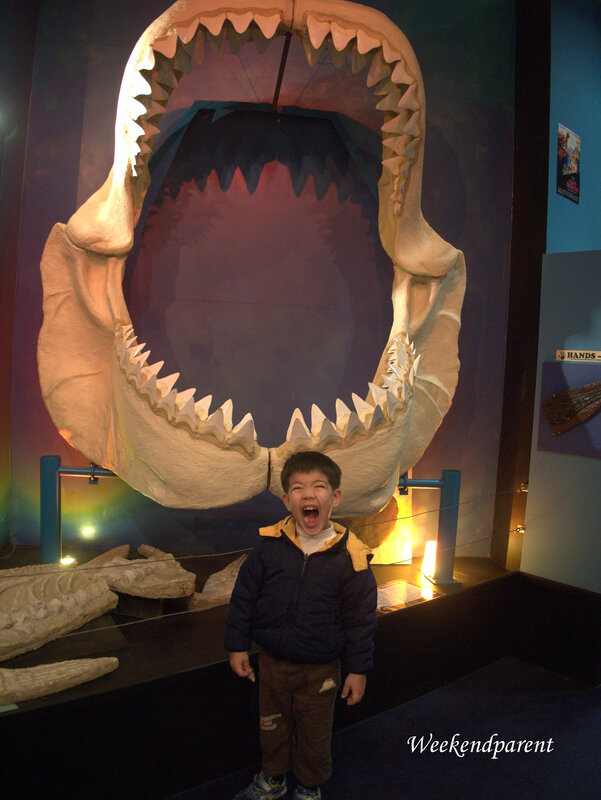 It is not a large facility, but it more than made up for it with the hands on exhibits, some unique items in its collection, and some scary animated dinosaurs. 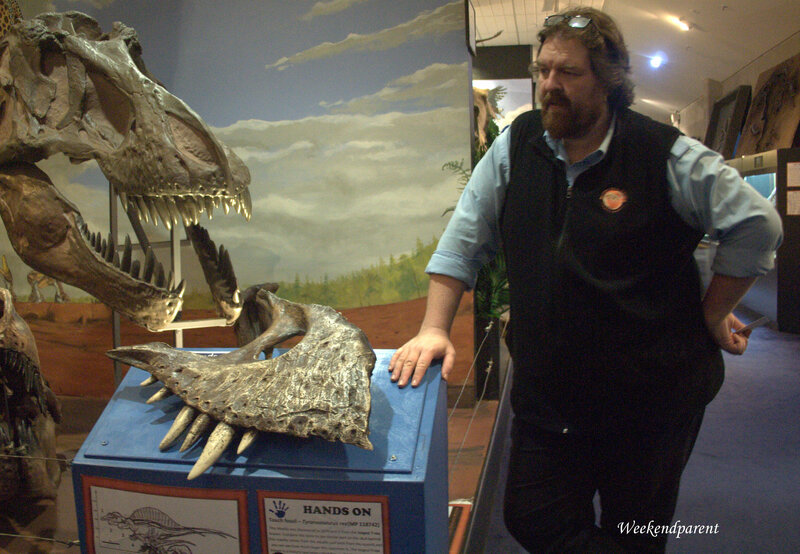 And we were privileged to have the indepth knowledge imparted by Phil, a staff member who loves dinosaurs so much he spent time at the Smithsonian Institute learning more about paleontology. We had lots of fun posing for silly pictures. And actually getting to touch things. Really old things like dinosaur bones and fossils. 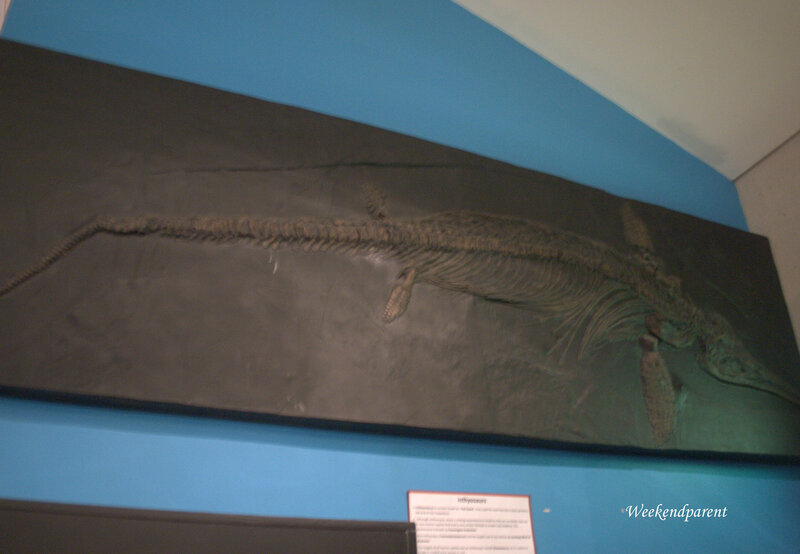 And on the topic of sea-dinosaurs, blink and we would have missed this amazing fossil of an Ichthyosaurus. This is currently Big A’s favourite, and it was THE thing he wanted to see at the museum. 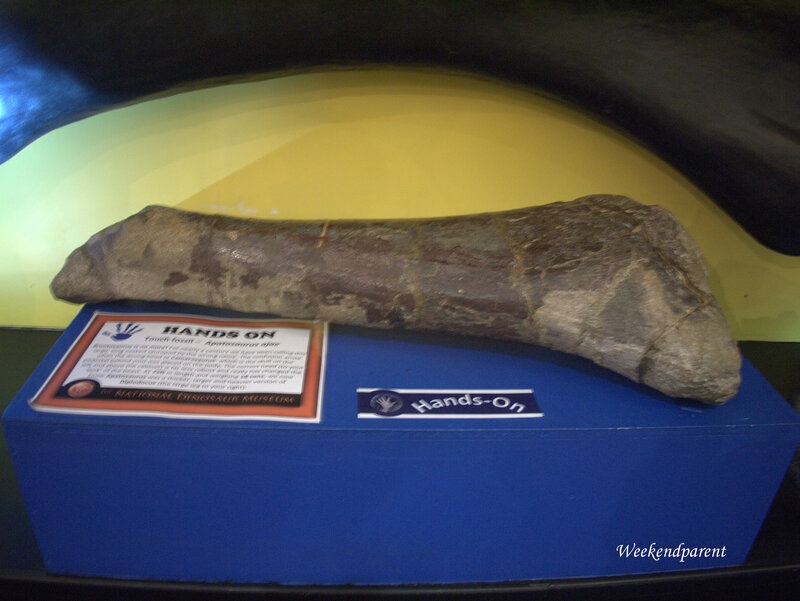 We also got to touch this Apatosaurus bone. A real bone. The interesting thing about this was that for years it was believed to be from the Brachiosaurus. But then scientists discovered that they had put the wrong head on the dinosaur. 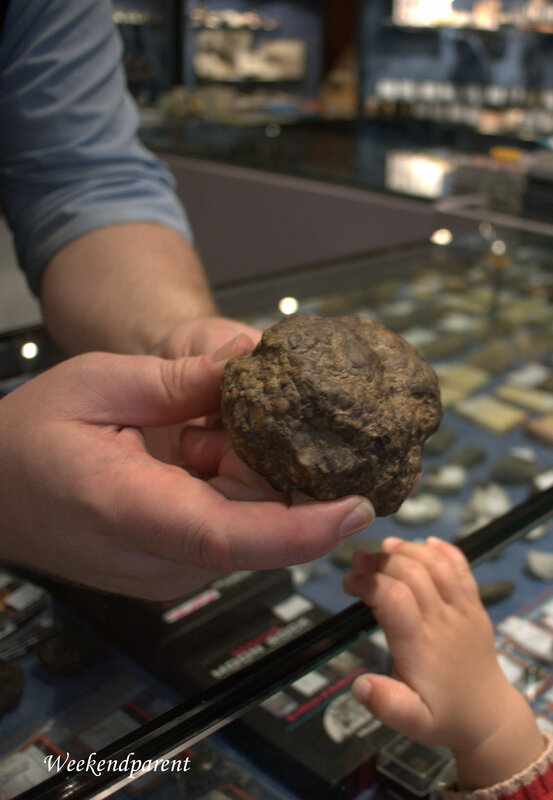 Little A kept patting this meteorite as if it was his good luck charm. Look up! 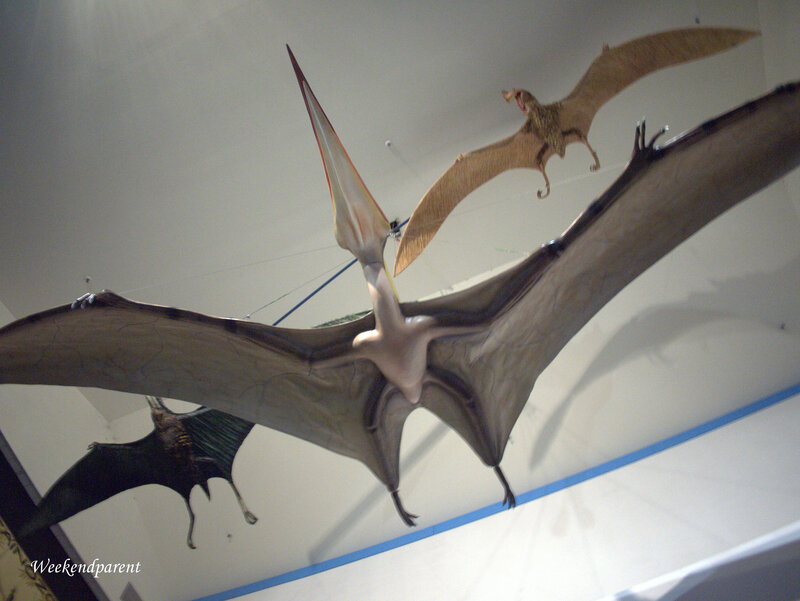 It’s flying Pterodactylus (amongst others). What’s this? Isn’t that a platypus? 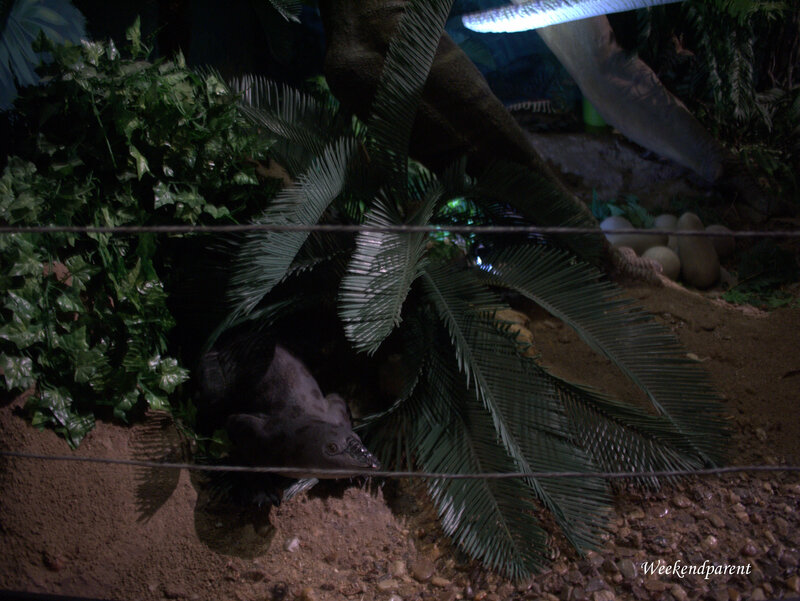 The platypus was around during dinosaur days, and so is hiding in the exhibit for Australian dinosaurs. I loved the cute name for one of the armour-cladded Aussie dinosaurs — the Minmi. The moving tyrannosaurus were even scarier (couldn’t even get Little A close). 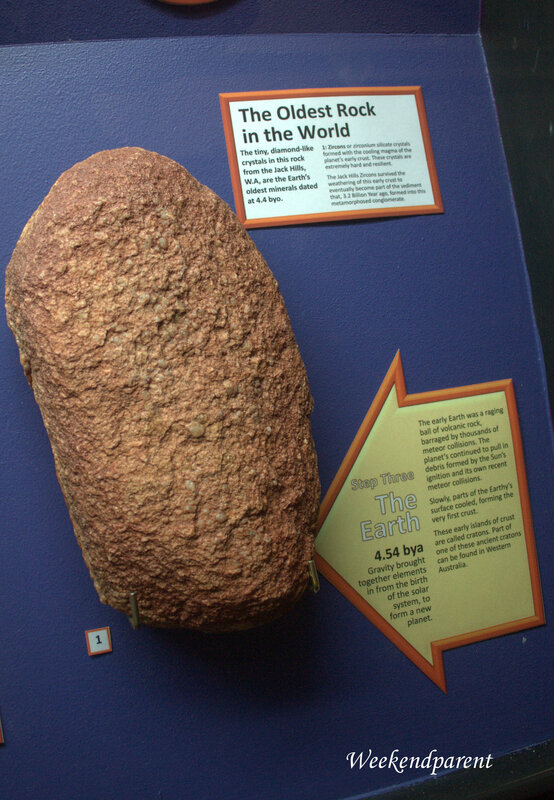 The oldest rock in the world. I thought all rocks were old, but this one is ancient at 4.4 billion years old. When you think that the Chinese do everything they can to prove that they have an ancient civilisation of 5,000 years … this 4.4 billion rock was there way, way before that. 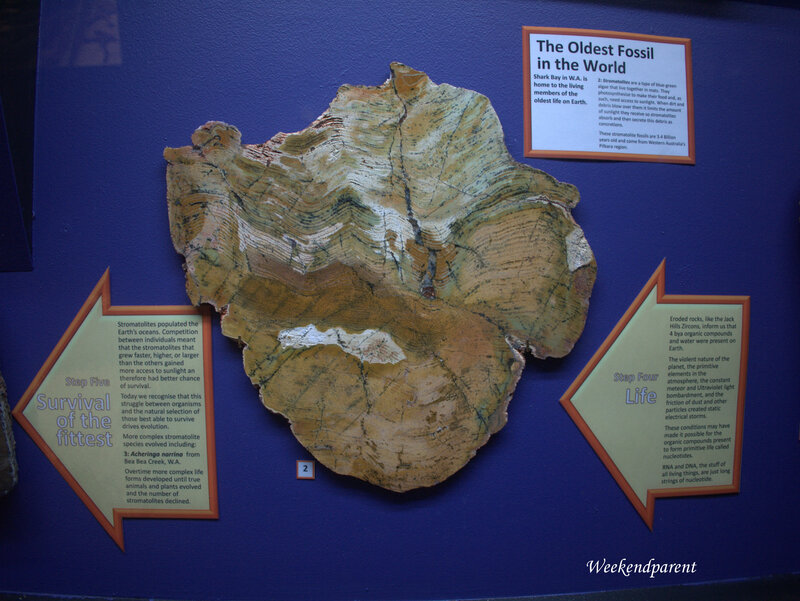 And the oldest fossil in the world. Not of dinosaurs, but of green algae. I thought this was quite pretty. This was a super fun trip for our busy boys. I liked the mix of hands on exhibits, cheesy photo opportunities (we are sooo Asian and never miss posing for the perfect Facebook family shot), and real scientific stuff. There are no super large dinosaur replicas (yet), but Phil said that they plan to put together a T-rex. 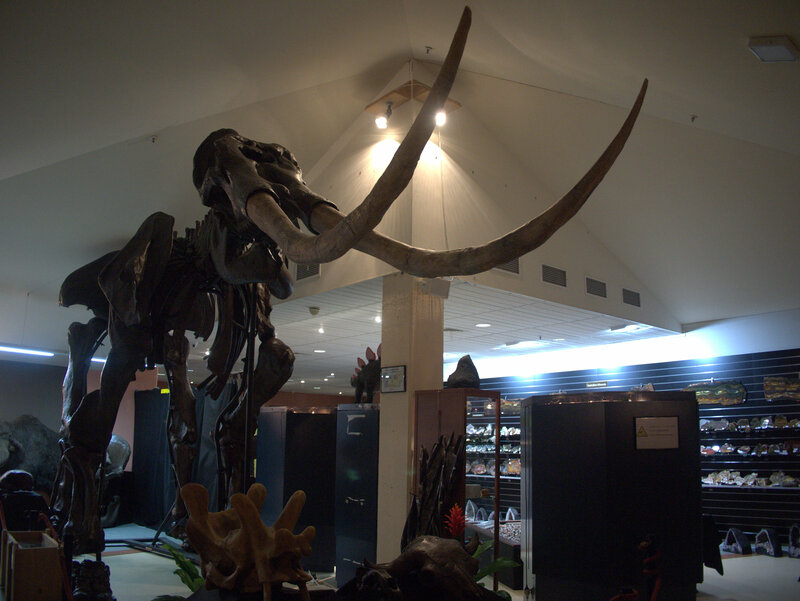 But recently the Museum has erected a stegodon skeleton (an ancestor to the mammoth). But I know what this is — it is a real Ichthyosaurus fossil, which Phil let Big A touch because he knew how much he liked these big fish. 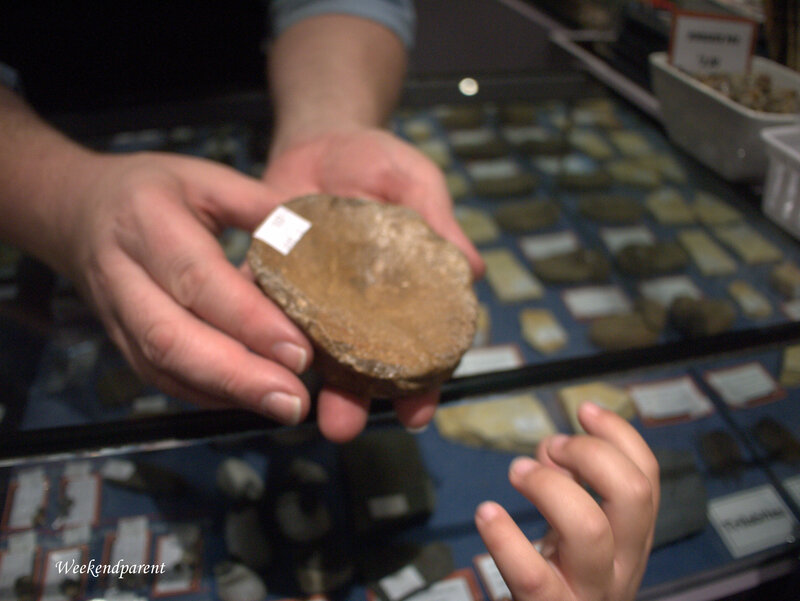 The Museum also has a range of real fossils for sale — some are very cheap. It seems amazing to me that you can actually buy such precious finds. 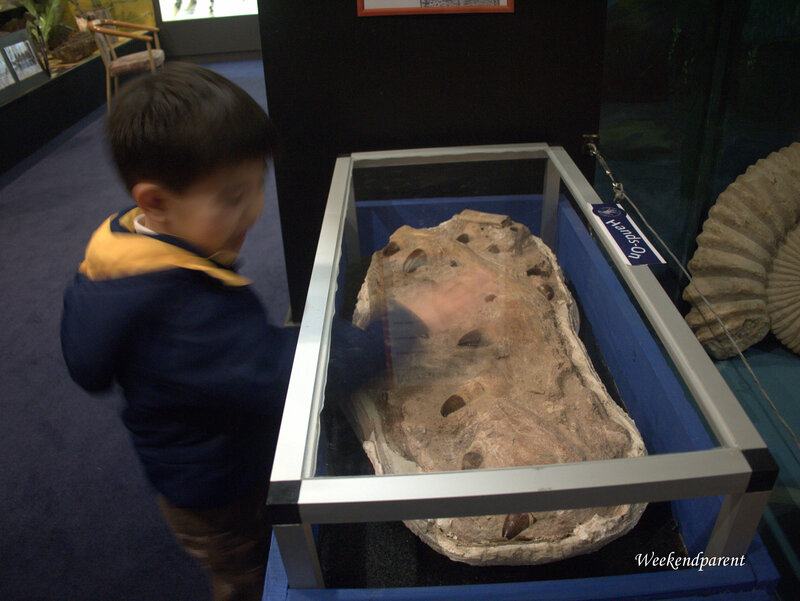 The National Dinosaur Museum is at the Gold Creek Village, just off the Barton Highway. They specialise in school tours, and also have some interesting options for themed birthday parties for dinosaur mad girls and boys. They even do evening parties on request. 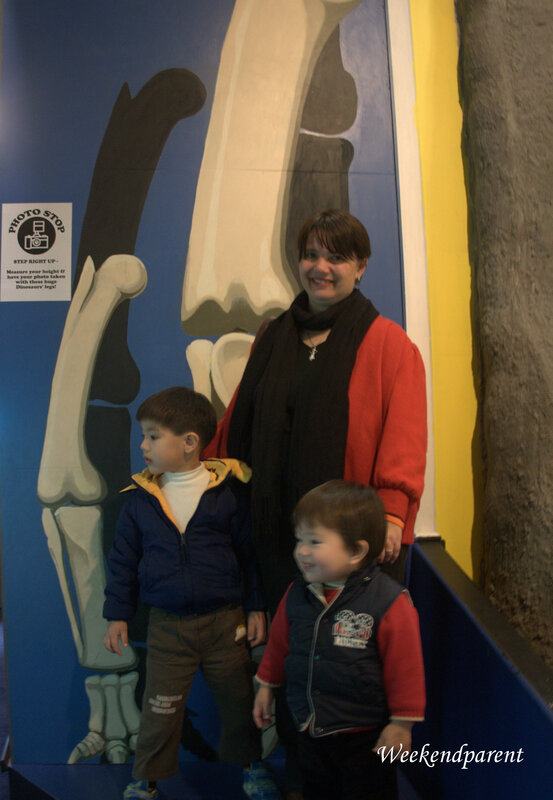 Weekendparent is a Canberra tourism ambassador participating in VisitCanberra’s 2014 Human Brochure campaign. Weekendparent visited this venue independently with her family.